Do you agree that unlimited zoom range should be brought back? Yes, but as a toggleable option in the graphics menu. So in one of the recent unstables, the build beam would randomly start lagging super bad on any tech after you placed a couple blocks on it or removed blocks from it. This was patched, thank god. But it still exists to some degree on larger techs, notably when repair bubbles, shield bubbles, and hovers (basically anything that can be controlled by a switch) are active. Even with them all off the lag eventually comes. Just to test, I started at 20 fps in the build beam and waited for the lag to come. At the lag's peak I was at 4 fps. I didn't even do anything, I just left my camera still and watched as the lag came. Now I don't expect you guys to try and fix this as it is very random when it happens and I can't pinpoint an exact trigger. Instead what I expect you guys to do is PLEASE, for the love of god bring back the unlimited zoom range. I have begged and I have pleaded and I have reported it SO MANY TIMES and so many people have agreed with me but you refuse to bring it back. On the off chance you don't know what I'm talking about, watch just 30 seconds from this video from the 3 minute mark. You can see how I am able to zoom into my carrier WHILE ANCHORED, causing no lag and none of these build beam problems. That zoom range that used to be available in any mode is now only available in build beam. This was introduced in the 1.0 unstable update I believe. 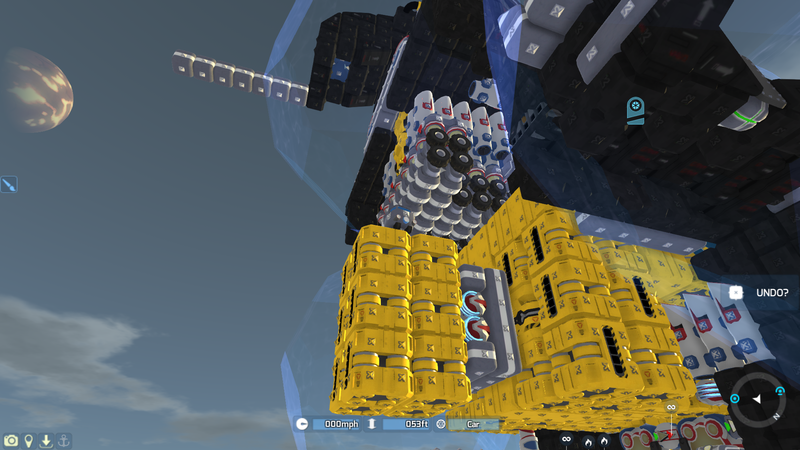 The lag is so bad that I have had to build my spaceship FROM A CAB. From a gosh darned cab. Because in a cab I can at least zoom in on the parts I need to in order to build. The picture below shows how I have been building my spaceship for a while, see that cab in the middle? yeah that's me. These problems with build beaming would not be major issues if only you brought back unlimited zoom range. Hey there Mindlessmrawesome, thanks for letting us know about this, can you provide a snapshot of the tech you're having this issue with please? We've got the zoom issue you've mentioned on our list, it's definitely not being ignored or refused. The zoom itself was affecting another part of the game and will need some new code to get them to both exist without issue, we'll get around to re-adding this soon! could we get the ability to place blocks correctly when theres an attatch point behind you? Can you give me an example of this? I think I know what you mean, just want to make sure. It might be a bit tricky to do, but I'll relay it on to the rest of our team. i will try to record it happening once school gets out. should it be put in a suggestions thread, or a bugs thread? The issue arises when the build beam fails to compete with the qualities of the other states you could have your tech in (the three states being build beam, anchored, and unanchored). The build beam definitely has it's use and all that, but it is the only way at the moment to zoom inside of techs (or even remotely close to them). Zooming inside of big techs is quite necessary to build them, but big techs also tend to be quite laggy- and they only get laggier in the build beam. Build beam has also had it's fair share of bugs in the recent unstable series which made building more difficult for a lot of people (not just large tech builders). So I was simply saying "instead of having the unlimited zoom range only inside of build beam, why not allow it while anchored and unanchored as well?" this would provide redundancy for building in case any more build beam bugs pop up, and would allow us larger tech builders on lower-end PCs to be able to build while anchored for more fps.